Paul Belk and his family. LIKE thousands of university students, Paul Belk decided to take time out from his university studies to travel the world. The young sportsman was excited by the idea of back-packing his way around Thailand with friends. But the trip to a tropical paradise island was to change his life forever and leave him in a wheelchair. For, as Paul relaxed in a bar, robbers slipped drugs into his drink, leaving him in a coma. The student's life was only saved by the actions of his friends and the fact that he had insurance cover to pay for expert medical treatment. Two years on, Paul is still unable to walk and has seen his hopes and dreams shattered. But he hopes that, through telling of his horrific experience, he can save others from a similar fate. The 22-year-old said: "Looking back, I wish I had never gone to Thailand. "This has changed my life forever and I only hope that what has happened to me will serve as a warning to others." Paul, from South Shields, South Tyneside, now lives in a rehabilitation centre. He receives daily visits from his dad David, an accountant, his mother Carol, who works for a children's charity, and his 20-year-old sister Sara, who is also a student. Paul, who left school with 10 GCSEs and three A levels, was studying for a BA honours in music at Newcastle University. He was a talented drummer, playing with a number of bands and was hoping to make a career out of drumming. Well-built and 5ft 11ins tall, he was a keen sportsman, playing in goal for a local football team, as well as being a member of a swimming club. He was also a highly-trained skier and had skied in the Alps and the Pyrenees. Carol, 55, said: "Paul was outgoing and very clever and talented. "He was in a steady relationship with a girlfriend and he had a bright future ahead of him. "He had set his heart on being a drummer. That was all he wanted." Paul had enjoyed family holidays to France, Spain and America. But he hesitated when two friends suggested a six-week trip to South East Asia. Paul said: "I originally didn't want to go. "It was my two mates who were keen on the idea and I decided to go at the last minute." David, 52, said: "About a week before Paul went to Thailand, I asked him if he had insurance and he didn't. "Young people tend not to think about these things. I went on the internet and arranged cover for him. "Looking back, it probably saved his life". In June 2005, Paul and his pals flew to Bangkok, before spending four weeks traveling around Thailand and the neighbouring country of Laos. They then headed for the island of Koh Tao, where they were looking forward to scuba diving in the tropical waters. After one week on the island, Paul's friends decided to head for Kuala Lumpur in Malaysia. Paul told them he was enjoying the diving course and wanted to stay in Koh Tao. He had struck a friendship with a group of eight young men from Ireland and felt confident enough to be left on his own. David recalled the last phone call he received from his son. He said: "It was a Thursday morning and he called me on his mobile. It was only a three or four minute call. "He asked me if I could transfer some money into his bank account because he was running low. "He seemed to be having a good time but he said he'd be coming back a week early because he had arranged to do a charity gig at a record producer's house and he was really looking forward to it." Paul before he went to Thailand. On the Saturday morning, David and Carol were disturbed to receive a phone call from the mother of Paul's girlfriend. She had been phoned by one of the Irishmen Paul was with. The Irishman had taken Paul to hospital and had then gone through the address book on Paul's phone in the hope of contacting his family. David and Carol spent the next four hours ringing Paul's mobile, before it was answered by the Irishman. He told them their son had been drinking in a bar in Koh Tao and Paul had been chatting with two Thai men. Paul had appeared drowsy and the two Thai men were trying to persuade him to go to a party. The Irishmen, who assumed Paul had merely had too much to drink, decided to take Paul home and he was put to bed in their apartment. The next morning, he did not wake up. His friends realised he was seriously ill and took him to a clinic on the island, where staff feared he had been drugged and was in a coma. But they were reluctant to treat Paul until it could be proved he was insured. His friends quickly returned to the apartment and found his insurance documents in his rucksack. 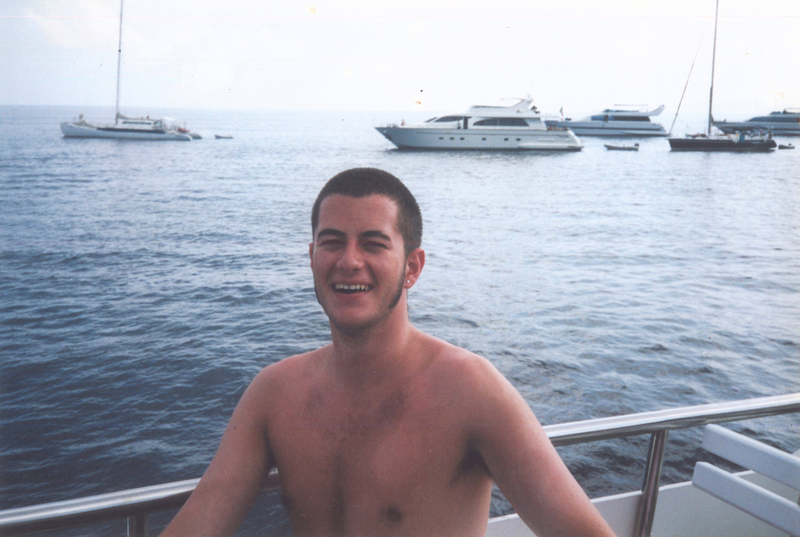 Paul was so ill, he had to be transferred by boat to a hospital in Koh Samui on the mainland. While Carol stayed at home, David decided to catch a 4am flight on Sunday from Newcastle to Amsterdam, where he caught another plane to Bangkok, followed by another flight to Koh Samui. David said: "It was Monday lunchtime by the time I got there and I went straight to the hospital. I got in to see Paul straight away. "He was completely unconscious and had tubes and wires linked to machines. I was terrified. It was only then I realised just how serious the situation was. "After I'd seen Paul, I went straight to see the doctor. He was Thai but his English was perfect. He told me Paul had been poisoned and his survival chances were 50-50." Exactly what happened that night has never been established. Paul cannot remember anything from the whole day. But, from talking to the doctors and Paul's Irish friends, David suspects the two Thai men put drugs in Paul's drink in the hope of robbing him. A gold bracelet and a watch he had been wearing were missing. David said: "We're just really grateful to the Irish lads who looked after Paul that night. "These Thai men had been wanting to take him away, presumably to rob him. "Also, if the Irish lads hadn't taken Paul to a clinic straight away, he probably wouldn't be alive today. "It was all reported to the police but there are only three policemen on the island so I don't think they were too perturbed about it. "When you go out there and you speak to the taxi drivers etc, they tell you this happens all the time but it's hushed up because of the tourist trade. There's a warning on the Foreign Office website." Three weeks later, Paul was flown back to Britain. Paul spent the next year in the Royal Victoria Infirmary and Hunter's Moor Hospital in Newcastle. He was diagnosed as suffering from anoxia - a condition caused by the brain being starved of oxygen. Paul said: "I was dead to the world for about six or seven weeks." "I regained consciousness slowly over a few weeks." It was October - almost three months after he had poisoned - before Paul was able to utter his first word. A nurse jokingly asked him if he wanted a beer and Paul replied: "Yes." With help from a speech therapist, Paul slowly learned how to talk again. A year ago, Paul was transferred to Chase Park Rehabilitation Centre in Gateshead, which specializes in treating neurological conditions. Paul said: "Some of the hospital staff said I wouldn't be able to walk again. That got me really down - as it would anyone. "There are low days but since coming to Chase Park I've made a lot of progress. I have to keep my hopes up and my thoughts positive. "My upper body is fine and I can move my legs - but it's hard. "Very slowly, I'm learning to walk again. I get botox injections in my leg to relax the muscles and I go swimming three times a week." David had to go part-time at work, while Carol had to take six months off. David said: "It hit us hard financially. "Even now, our life consists of work, visiting Paul and going to bed. "I think the hardest thing is that nobody can predict the future. But you have to put all your anger into trying to make things better." Meanwhile, Paul's parents want to warn other young men and women planning back-packing holidays. David said: "The Thais we met were all professional and from a caring background. But Thailand is very much a third world country. "To the average man on the street, life is cheap. These backpackers are fairly wealthy and the average man on the street doesn't have anything. They are envious of the life they have and I think they want a piece of it. "My advice to other backpackers would be to stay with people you know and watch who you're being friendly with when you're drinking." Paul, who has been told it could be a year or longer before he is allowed home, is considering doing a degree in Information Technology when he is well enough. He said: "On one level, I'm very angry but I try not to feel bitter because that isn't going to get me anywhere." "But if you ask me how I feel now, I just wish I hadn't gone on that trip. My life has been changed forever." Paul’s story appeared in a Sunday national newspaper and two women’s magazines. The photographs of the family were taken by Dave Webb.